Co-innovation to make innovative ideas successful! The world is full of innovations and new ideas such as Internet of Things, Artificial Intelligence, Machine Learning, Chatbots, Big Data, Predictive Analytics, Blockchain and Conversational UI. And, many ideas are suggested by employees within your company, whether or not under pressure from your competitors. But where do you start? How do you make it concrete? How does it become successful and distinctive for your customers? We are convinced that co-innovation is the way to make innovative ideas successful. Your input of objectives, pain points, wishes, product / service knowledge, business industry experience combined with a partner with real customer experiences, innovation drive, technical know-how, architecture and broad experience with innovations are the success formula. We follow the latest trends, try out the latest innovations and know everything about the latest SAP innovations and roadmap. We continuously look for opportunities for our customers to apply these innovations. And we are eager to share this knowledge and experience with you. Find a partner, visit events, attend workshops, read articles and be inspired by innovative possibilities for your company and identify your objectives, pain points, wishes and ideas. 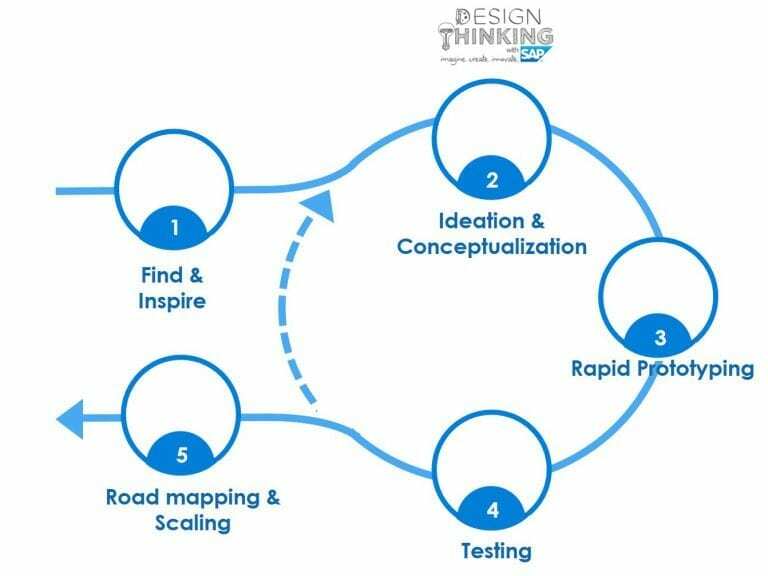 Use Design Thinking to brainstorm, to conceptualize, to bring ideas to life, prioritize ideas and make ideas concrete. Start from your customer point of view by using personas with customer journeys and business value modeling. Make a working solution of the chosen innovation idea in short iterative sprints. We can use your existing architecture together with our SAP landscape that we have in place for experimenting, developing and testing. Rapid prototyping and iterations are the key to success. Make a small team that creates small things in a short period of time. Experiment, measure, test and improve quickly so that the investments and risks are small, and the chances of success are big. After testing has shown that your objectives and wishes have been met and the customer experiences have been surpassed, you must determine together with all stakeholders how the innovative idea will be implemented and rolled out within your organization. We have previously tested this approach at companies such as Office Depot, Achmea and Dimo Systems. And we are looking for co-innovation projects with you! Do you have innovative ideas in the field of IoT, AI, machine learning, chatbots, blockchain, speech, big data, etc., then we would like to offer you our broad innovation experience, technical know-how and architecture. Together we can realize your competitive advantage, new business model and business development through innovation!